15 years ago today, Dandy was writing proudly about his Flopsy Girl. As Promised, I did poo on the carpet... well not exactly on the carpet, but I poo'd on the plastic mat that our food basket sits on THAT SHOWED THEM! The trouble is though, they (the 2 foots) get so unreasonable. I mean, despite the odd little complaint I MAY have made, it's been pretty good for the last few days. The 2 foots have not been out much, and they have not made us go in our cage at all, however...... Last night (well this morning actually at about 2am), the 2 foots decided to go to bed, but before they did, THEY MADE US GO IN THE CAGE! We made it QUITE clear to them that this was totally unacceptable, but it made no difference at all. 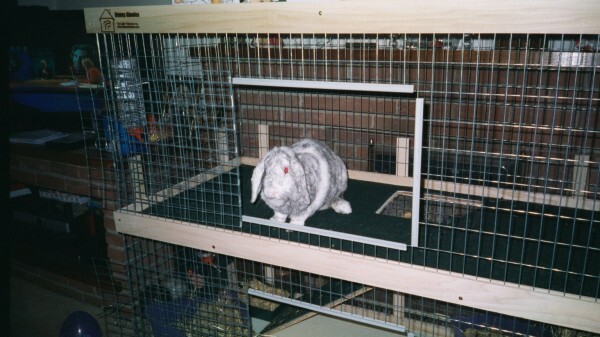 They FORCED us (yes dear readers forced) to go out of the living room, and into the hall, and get in our cage. Flopsy girl got REALLY mad. She just gave the 2 foots time to get into bed, then she started stamping. She did it again, and again, but STILL they would not come. I would not be at all surprised if an unsuspecting 2 foot were to get a nasty nip tonight when they try to lift Flopsy girl out of the cage!